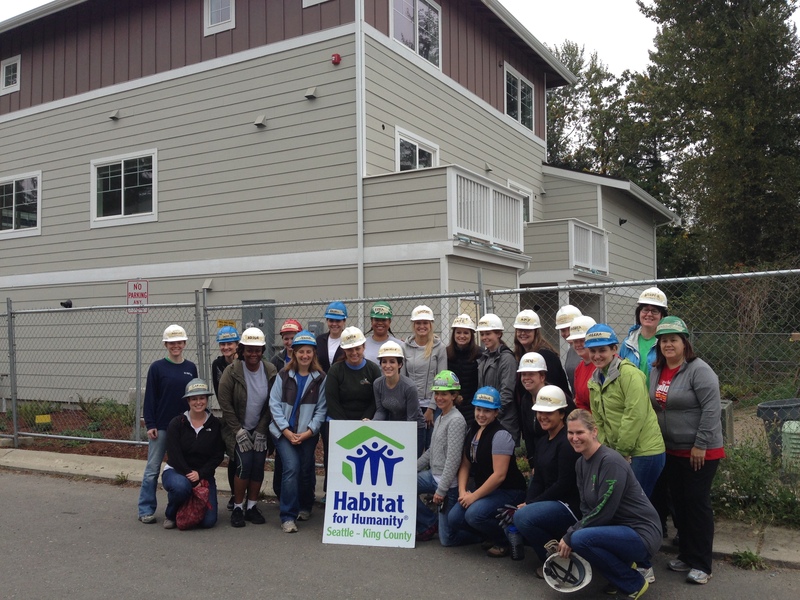 On September 20, 2014, the Junior League of Seattle partnered with Habitat for Humanity to work on the Habitat for Humanity La Fortuna site in the Renton Benson Heights neighborhood. The property of the build site was once vacant land within an area of residential homes built from approximately 1960 to 1970. Once complete, it will provide 41 low-income families with both an affordable home and an affordable mortgage in a new housing development in Renton. Environmental stewardship and long-term affordability will be ensured by constructing townhomes to achieve or surpass Energy Star and Master Builders “Built Green” 4-Star sustainable building standards. Currently 12 families have already moved into their new homes at La Fortuna. 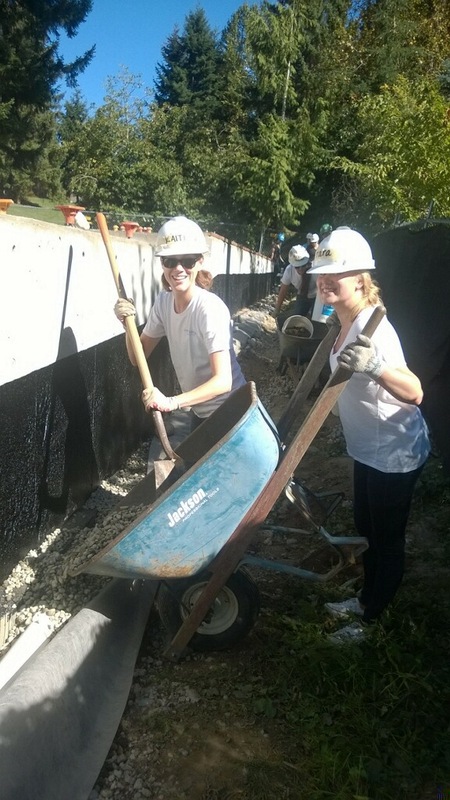 To help with this build, Junior League provided 49 volunteers consisting of Provisionals, Actives, and Sustainers for a total of 294 hours of service. Two of the leaders for the day were workers from Americorps, an organization which provides Habitat for Humanity new workers every year. Alongside the JLS volunteers were other volunteers who come on a weekly basis, and even some of the future homeowners themselves who were eager to see the progress on their new homes. The projects for the day included completing finishing touches on one of the homes, cutting and placing flooring on a stairway, moving rocks to line the drainage system for an unbuilt home, and maintenance of a wetland area to help with the efforts of the Green Build. JLS was blessed to have beautiful weather for this hard and physically exhausting day. Fortunately, the weather and reminder of the important work being accomplished brought a smile to everyone’s face as they worked. Lunch arrived as some League members were ending their shift and others were just getting started with renewed energy. This was truly an amazing opportunity to sit down and talk with some of the future home owners, Americorps workers, and Habitat for Humanity employees and volunteers. Overall, it was a very successful day! JLS is excited to continue to partner with Habitat for Humanity in the future. 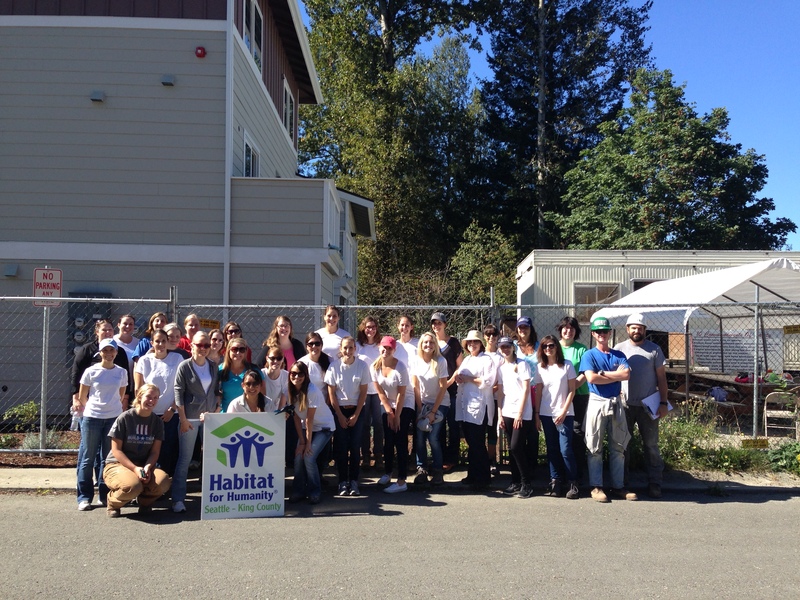 Together, Junior League of Seattle and Habitat for Humanity can create powerful change in our community. What is Nominating and what do they do? Nominating is a committee comprised of members with significant leadership experience within the Junior League of Seattle who place interested members into leadership positions. Nominating also seeks to foster leadership skills and potential in their fellow League members. Nominating’s slating process allows consideration of each member who is qualified for a specific position. Slating involves choosing the right person for the right job at the right time. Leaders will be slated and/or placed based on experience, interest, skills and availability. a. Contribute to leadership development by educating the membership about the Nominating process and volunteer career planning: b. 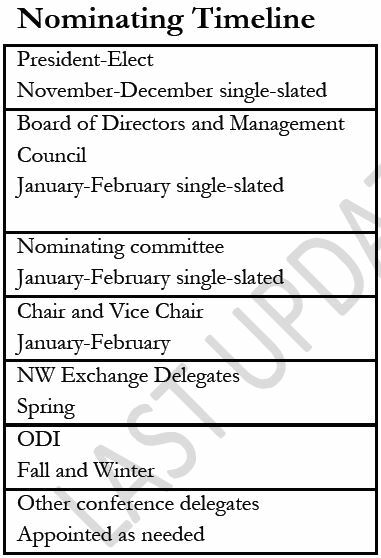 Slate: The Board of Directors, Management Council and the Nominating Committee Members; c. Appoint: Committee Chairs, Vice-chairs, Long Term Financial Planning, President’s Assistant’s, President-Elect Assistants, Provisional and Active Advisors, and other positions deemed sensitive by the Board of Directors; d. Select delegates for overnight conferences; e. Cooperate with the Area VI and AJLI regarding candidates for Area VI and AJLI positions. Who serves on this year’s Nominating Committee? What are the members of Nominating’s favorite placements? What’s the best way to show my interest in Leadership to the members of Nominating? Complete a leadership application through our website, and attend a Leadership Information Session this month. Additionally, should you have any questions about leadership opportunities or would like to discuss your Junior League career please reach out to any member of Nominating. What are the Leadership Information Sessions? A Leadership Information Session is an opportunity for you to spend 30 minutes with two members of Nominating to discuss your interest in future Leadership in the JLS. It is a great opportunity to learn more about leadership, your future options, or to discuss specific placements. Attending a Leadership Information Session should be considered mandatory for any Active member interested in applying for President-Elect Nominee or the Board of Directors. Leadership Information Sessions are strongly recommended for anyone interested in a slated position. Anyone interested in learning more about leadership opportunities is welcome and highly encouraged to attend. What is the difference between a slated and non-slated position? The Slate is comprised of the following: Board of Directors, Management Council, and Nominating. The Non-Slate is comprised of all other leadership roles. What steps should I follow if I am interested in applying for President? Review Nominating’s Guidelines for the President-Elect on pages 75-76 of the Governing Documents. Attend a Leadership Information Session. Seek out advice from former Presidents. There are two past Presidents serving on Nominating currently. Familiarize yourself with all aspects of the League. Download the President-Elect Application form from the website, complete it, and email it to the Nominating Director by the due date, October 27th. If you have any questions please do not hesitate to reach out to the Nominating Director, Jennifer Porto. What is the timeline for placements? Applications for all other leadership roles are due on January 5, 2014. Where are the applications located? Leadership applications are found on the Member area of our website, under “Leadership” – Nominating. Why does Nominating have a “code of silence” regarding placements until the leadership roster is full? Applications are confidential and read only by the Nominating Committee and discussed only among the members of Nominating. Out of respect for league members, all placements are confidential until all members have been notified of their placements. What are some important things for incoming leaders to know? The League Year runs from June 1st to May 31st. The Annual Leadership Retreat, which is mandatory for all incoming leaders is tentatively scheduled for June 2015. Leaders shall be available for outgoing and incoming transitions between leadership positions; this means that both incoming and outgoing leaders are responsible for meeting in late May or early June to ensure a smooth transition. A budget planning meeting is mandatory for managers, committee chairs, and committee vice-chairs and will take place toward the end of January 2016. All leaders are expected to be in good standing.